Alex’s (Team Hydra) thoughts: With how the two players involved in the trade are currently performing, this is an incredibly unsexy challenge trade with each team hoping that the guy they added can turn it around. Just looking at the names involved, Allen seems like the guy most likely to do that. He’s coming off 3 straight seasons of an 11 K/9 or better with his ERA and FIP under 3.00 in each year. Latos, on the other hand is coming off a season where his ERA was 4.95 and he hasn’t had a K/9 over 8 since 2011. Both have struggled this season. Despite recording 8 saves, Allen has only averaged 1.63 P/PG but this low score is weighed down from 4 negative outings which were 4 of only 5 appearances where he’s allowed an earned run. The bigger problem, at least from a fantasy perspective, is that only 2 of his 13 appearances have resulted in a score of more than 6 points which has prevented him from making up for the negative points. Steamer projects his rest of season numbers to result in the worst K/9, BB/9 and ERA since 2012 but still result in a nice bounce back from where he is now. Latos’ value is much harder to pinpoint. Between 2013 and the half season he played in 2014, Latos put up 24 starts of over 30 points. Last year he only put up 8 such starts. He then started 2016 with 3 straight starts of 40+ points before posting 13, -14 and 9.5. Latos currently has an ERA of 2.62 but a FIP of 4.44 an ugly K/9 of 4.98 and after making big cuts to his HR rate in 2013 and 2014, it jumped up to over 1 HR/9 last year and has climbed a bit higher so far this season. Most concerning is that Steamer projects the HR rate to get noticeably worse (1.26 HR/9) while basically every one of his stats is worse than his 2015 season. So now that I’ve proven I can copy stats off of Fangraphs, what’s all this mean? Well it’s easy to see Jordan’s thinking in making the move for Latos. Jordan has a solid bullpen already and with our league’s scoring, the best RP (Andrew Miller) has 68 points while the 30th best RP (Kyle Barraclough) – who isn’t even on a team right now – has 48 points. That’s an advantage of only 4 points per week between the best and a middle of the road RP. So Jordan could either hold on to Allen with the hopes that he regains form and either gives him a small advantage or allows him to trade him away at a high point. However we have no established trade market for RPs and as more people realize something that a few teams have known since the draft – spending money for RPs in this league makes no sense – Jordan’s decision to sell Allen seems like a smart move. The question is really, does Latos give him any advantage at all. He’s only Jordan’s 8th SP so he could use the depth and if Latos can find a glimpse of 2013/2014, or Jordan can accurately find those 5 or so 30+ point starts, then sure why not! For Bailey, I’m not as big a fan of the move. Bailey’s team is currently last in the league in points scored which means any moves Bailey makes need to be big improvements this season or ones that focus on the future. 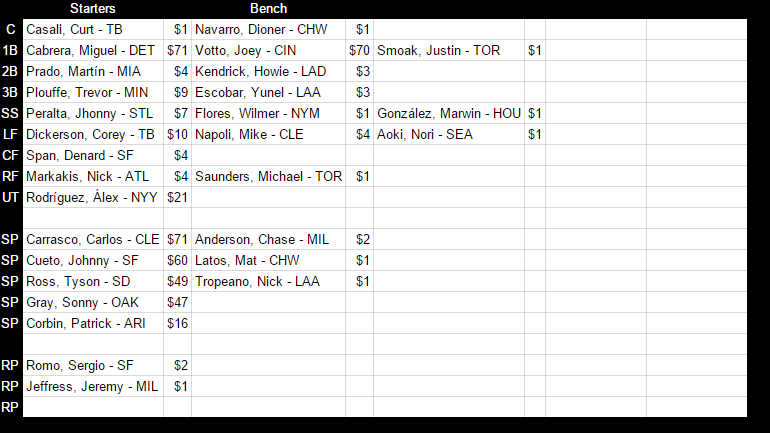 Now Latos is not the future, even at $1, so trading him away is fine. And turning a 5th round pick into a 3rd round pick is great but a 3rd round pick isn’t really worth much. My bigger issue with the deal is that getting Cody Allen, even if he becomes 2015 Cody Allen, isn’t going to be a move that really does much for Bailey this season and as I’ve said, who knows that the trade market is for RPs. So grabbing him with the hope of flipping him seems ill advised. Allen was also $10 which wasn’t a bad price in the draft but at $12 next year, Allen would really have to go back to being elite to even be worth considering holding on to and even then, I firmly believe paying for RP is a mistake. Right now, it’s possible that Allen was all Bailey could get for Latos but if Bailey really is looking towards the future, he has all season to make these deals and selling Latos after 3 very poor starts for a struggling RP seems like a move just to make a move. If there’s one thing I learned in this league it’s that someone will always pay for SP so waiting for him to put together a few good outings and trying to sell for essentially anything besides a RP seems like the better play. At the end of the day, I just wrote 800 words about two players who probably won’t have much of an impact in any way so I think I’m the one who lost this deal!